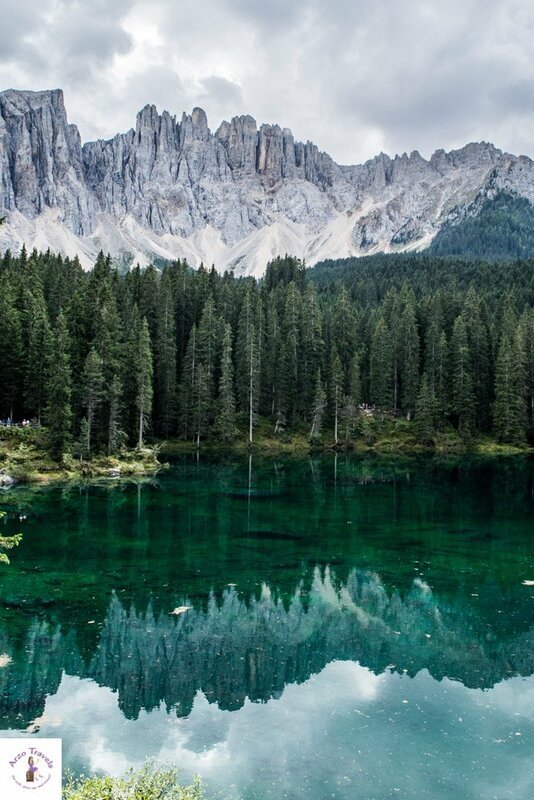 If you are looking for the most beautiful lakes, go to Switzerland – or to Italy. 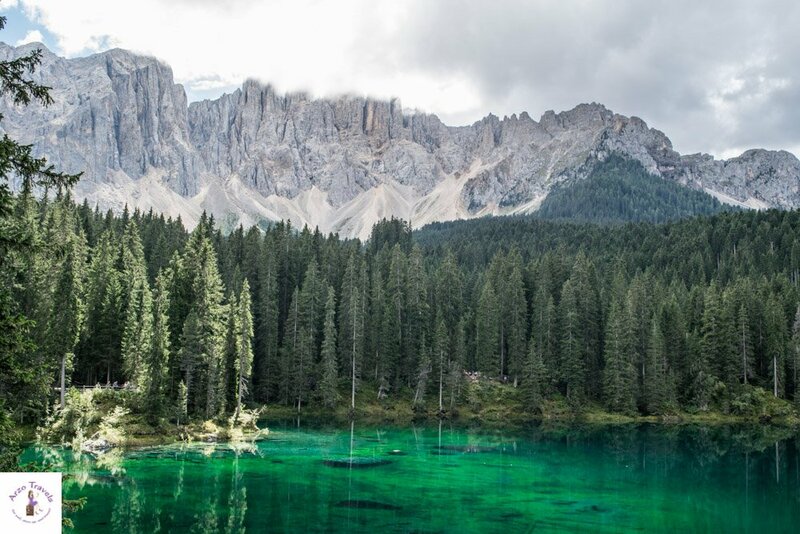 Italy, especially the Dolomites region, is home to some of the most amazing and jaw-dropping lakes in Europe. 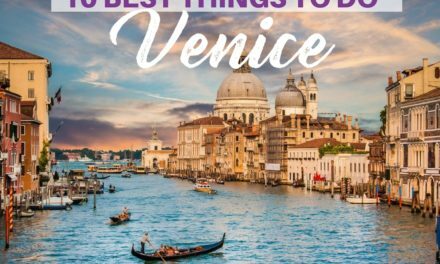 While I did road trip Central Europe and Northern Italy, I was looking for the most beautiful lakes in each country. 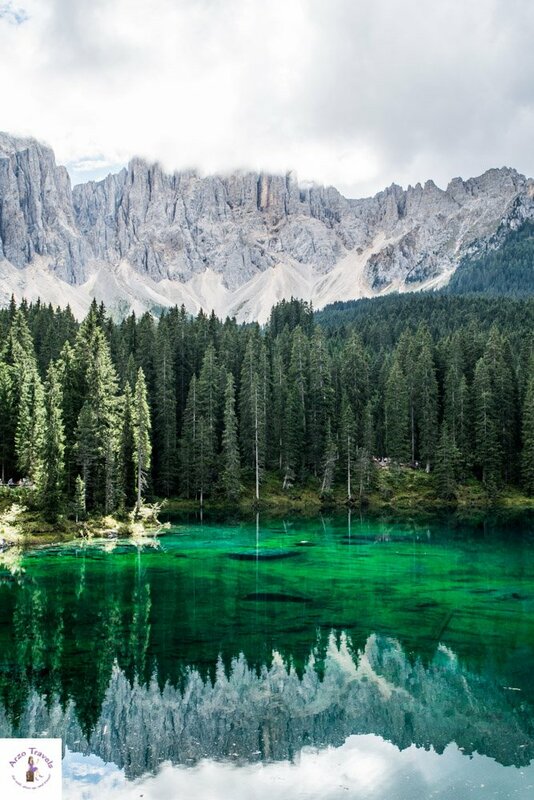 I found several astonishing lakes in Italy. 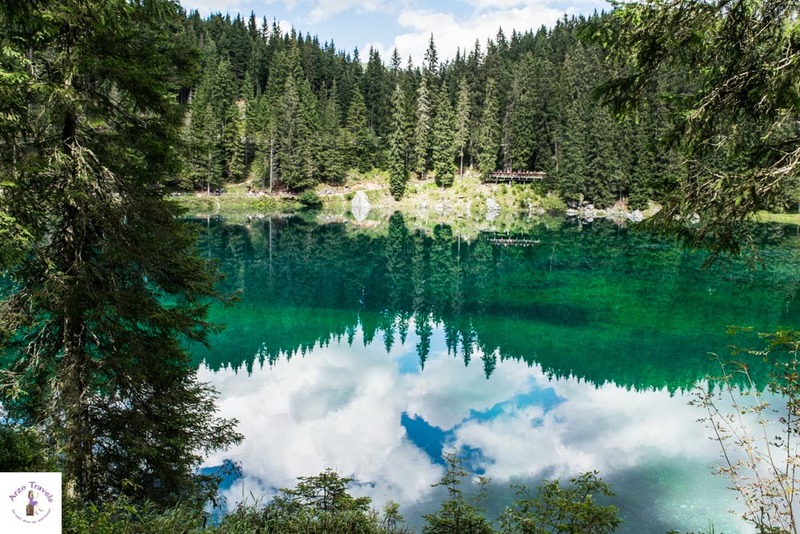 I visited the beautiful Pragser Wildsee (Lago di Braies) and the Lago di Sorapis – but here is is one of my all-time favorites: Karersee, also known as Lago di Carezza (or Lake Carezzo in English). I was so overwhlemed by its beauty. While mountain lakes often require some hiking, this lake is served to you on a silver platter. 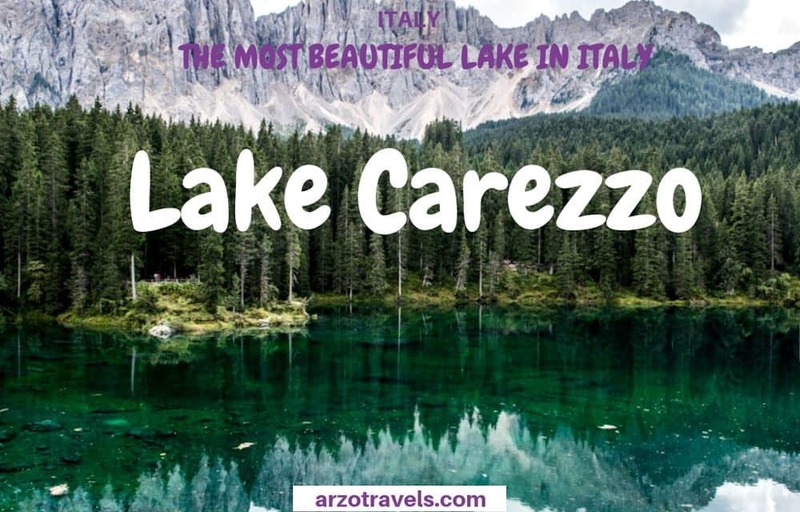 Well, more or less, but find out and read all the information you’ll need for your trip to Lago di Carezza. The lake is known as Lago di Carezza, Karersee, or Lec de Ergobando. Due to its complicated and difficult history in the region (South Tyrol used to be part of Austria for a long time before it became part of Italy in the 1920s), three languages – Italian, German, and Landin – are spoken there today. 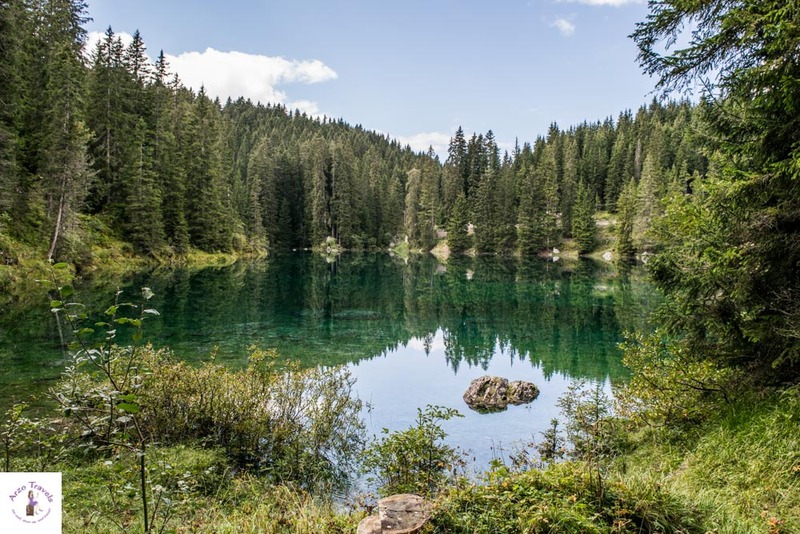 The lake is located in the Western Dolomites, 6 km from Nova Levante. It is a mountain lake, so getting there is a bit time-consuming – it lies 1520 meters above sea level. You could hike up there, but I think driving there is easiest. You should feel comfortable driving in the mountains though, as the streets can be winding and narrow. Italians tend to drive on more than one lane, so I recommend driving a bit more slowly to be safe. At the top is a parking lot. One hour costs 1€ (first 15 minutes are free). The lake is just behind the toilets and take-away restaurants. 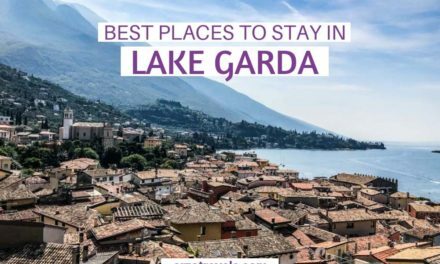 Imagine this: You just get out of the toilet, and on the way out, you are still arranging your clothes and then you, more or less, turn around and there it is: One of the most stunning lakes. No, I cannot say I was prepared for so much beauty just behind the toilets. So, while I appreciate beauty that comes without any effort, I can honestly say I was a bit speechless and probably just stood there for a moment, transfixed. After a time, I collected myself and started to enjoy the lake from the platform. 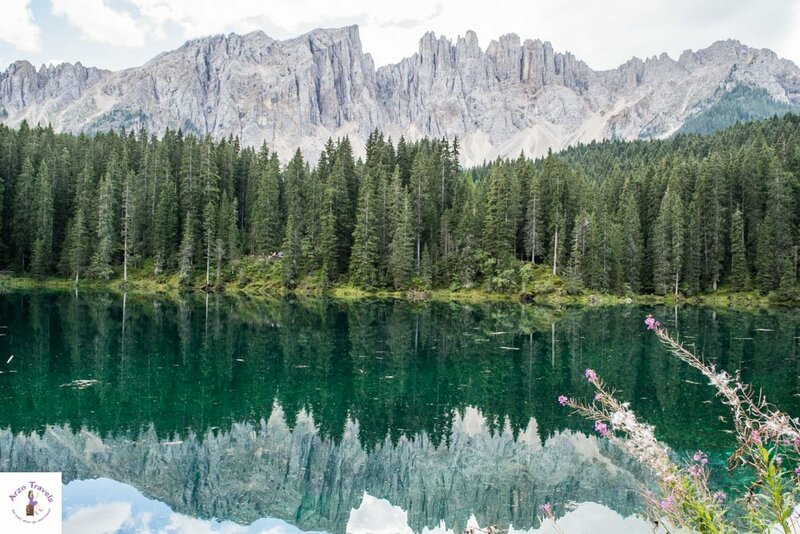 This lake, with its gorgeous color and view of the Rosengarten and the Latemar mountain ranges (part of the Dolomite mountain range), makes this place one of the prettiest I have seen in a while. Lake Carezza is fed by subterraneous springs from the Latemar Group. In October, the water level is at its lowest, while it is highest in spring and summer. The constant water level changes mean that it ranges from a depth of 6 meters up to 22 meters. The lake is tiny. 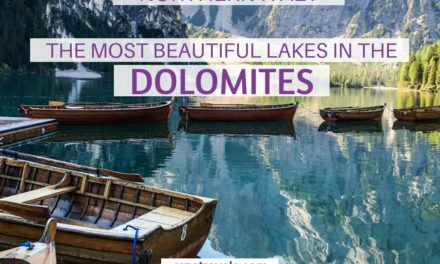 As you can see from the images, it is just a mini lake, but we can see that size doesn’t matter because it still beats all other lakes in Italy. 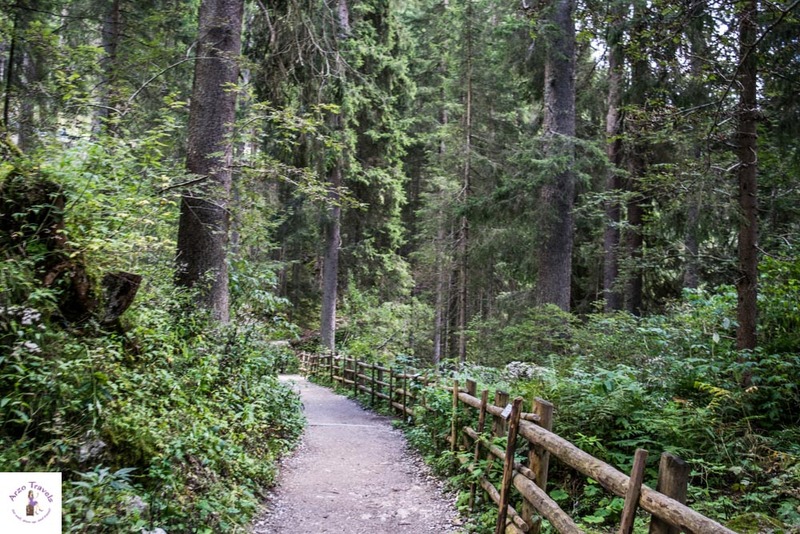 You can take an easy stroll, which takes about 10-15 minutes. 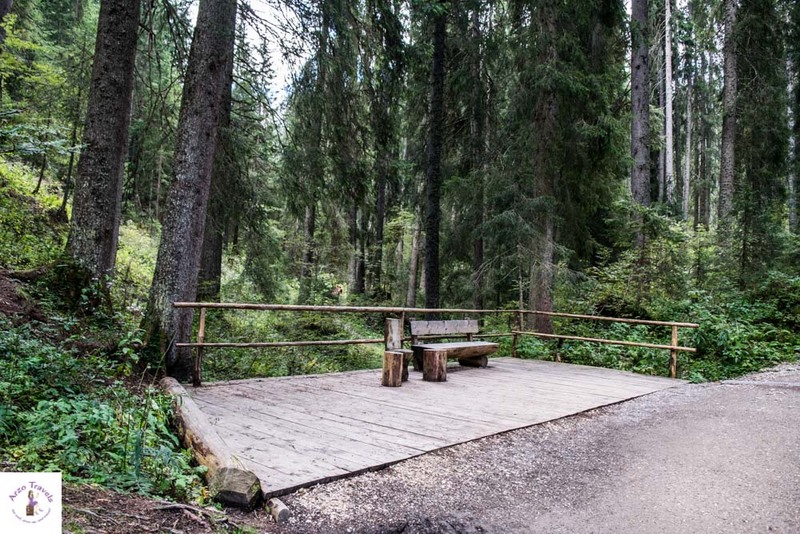 If you have time, bring some snacks along and take a seat on one of the benches – though I have to say that the most beautiful view is from the platform with the Rosengarten and mountains in the background. 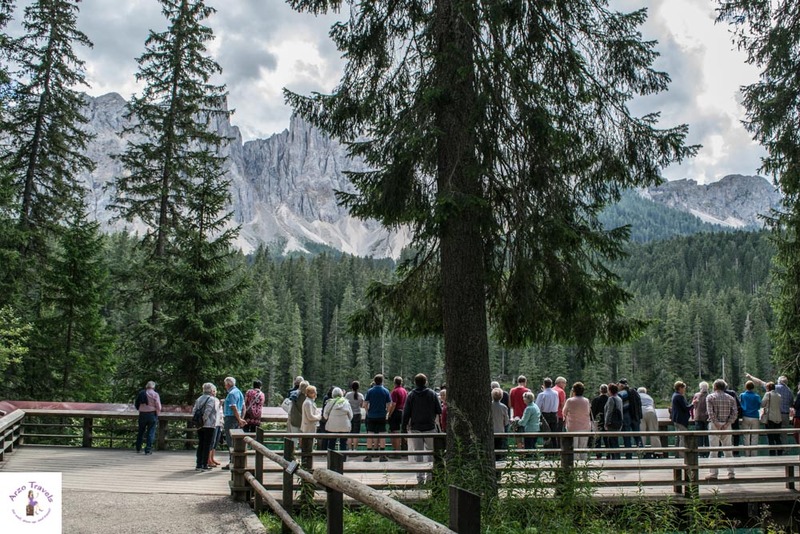 READ MORE: Here is my post on the perfect Dolomites itinerary! When there is a lake with an interesting color, it often comes with a myth. Wizard Masaré was in love with a mermaid living in the lake. In order to seduce her, the witch Lanwerda advised him to dress up as a jewel merchant and throw a rainbow from Mount Catinaccio to Mount Latemar. That is what he did, but he forgot to dress up. So, the beautiful mermaid detected him and forever disappeared into Lake Carezza. The wizard was angry and threw all the pieces of the rainbow, as well as the jewels, into the waters. That’s why it still features rainbow colors. As mentioned, there are toilets right next to the lake. There are also snack stalls selling fast food (fries, sausages etc.) and drinks. Though I have seen more stunning and drop-dead gorgeous lakes in Italy during that road trip, this lake was probably my favorite. 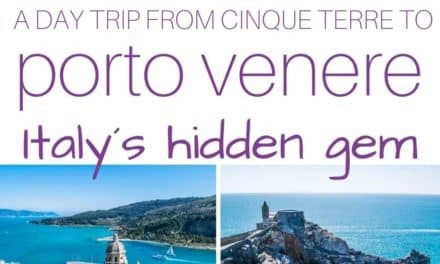 It is one of my travel highlights in Italy, even though there were many other people who visited the lake and it is surely not a hidden gem anymore. But, in the end, it is understandable that people want to visit this place. The beauty speaks for itself, though I have read some opinions from those who were disappointed by the little water it carries. Surely, I was lucky enough to see the lake when it was at its deepest, but I am sure it is a beauty at any time of year. I hope, you enjoy the lake as much as I did. Though, getting there probably takes some time, it is definitely worth it!